Well I wanted to update you on my personal experience with them. I have since gotten some of the hair ties and I have to say that I am a big fan. I have been wearing them on my wrist at work and have gotten a bunch of compliments. 3 of the girls I work with that have even ordered them over the past few weeks. Cons: The only bad thing that I have really heard about them is that they are a little expensive. I can partially agree – BUT in that same breath – I have to say that they are donating portions of their profits to charity so I don’t have a problem paying the prices that they ask. 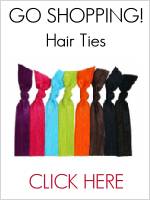 Overall, I am thrilled with the hair ties – they are cute and they do the job! I think that it would be wise for you to buy some too – for yourself, your friends, your daughters. They would definitely make great gifts!